I’ve been wanting to review these Ivation Heated Gloves for a while now because they’re one of the most affordable pairs of heated gloves on the market. Not everyone is willing to spend $200 on a pair of heated gloves so I thought these would be a good option since they’re under 50 bucks. If you’ve browsed around this website or done any research at all on heated gloves you probably already know that they aren’t cheap. A lot of pairs are selling for over $100, some over $200 and even some over $300. A lot of people feel like that’s just too much to spend on a pair of heated gloves. I personally have no problem forking over $300 if I know I’m getting a high quality product but I realize that I’m probably the exception to the rule. For those of you looking to get into a pair for under $50 USD then you will probably be interested in the Ivation 3.7v gloves. When I first spotted these gloves and saw the price tag I immediately wondered why they’re so cheap. A lot of regular gloves cost more than these and these ones heat up. So I did some reading and the first thing I noticed was that these come with two 3.7v batteries which is a lot less power than most of the gloves I review here. That’s the only thing that I noticed right off the bat that gave some sort of indication as to why these are so much cheaper than the others. Let’s see how they scored. The gloves felt pretty good when I first put them on. They just feel like a regular pair of winter gloves. They actually reminded me of the old Kombi gloves that my parents bought me when I was a kid. They’re pretty fluffy to the point that I’d almost call them bulky. I’m not a big fan of bulky gloves but I can get over it in this case since they aren’t expensive. Since they’re a bit bulky they don’t offer much in terms of dexterity. Even doing up coat zippers or buttons is a little challenging with these on. The inside of them is lined with fleece which is very nice. The palms are leather which is good for grip and comfort. The cuff has a bit of a gauntlet so you can wear them over your sleeve if you want but it’s also small enough to fit under your sleeve. The velcro on the cuff allows you to tighten them up nicely so that they’re snug on your wrist and they won’t come off during physical activity. As for warmth, they’re pretty warm just on their own without the heat on. With the heat on they warm up pretty fast. There are three heat settings and you can see which setting you’re on by the color of the button. I will say that I was a little bit disappointed by the heat elements. The elements run along the back of the hand and along the back of both fingers. I’m not sure why they chose to put the elements on the back of the hand but I prefer when the heat is on the palm of the hand except for with motorcycle gloves. I just find that the heat feels better on the palm. 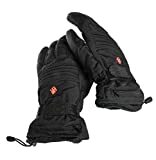 They’re actually saying on Amazon that these can be used as a motorcycle glove and that could be why they put the heat on the back of the hand. Personally I wouldn’t use these as a motorcycle glove thought because they don’t offer very much protection or dexterity. Aside from the heat placement I also found the temperature to be a little underwhelming. I’m probably just a little bit spoiled because I’ve been using gloves that are 7v and higher which put out a lot more heat. That being said, they do heat up and they will keep your hands much warmer than non heated gloves. For the comfort category I’m giving them a 16/20 and for the warmth category I’m giving them a 15/20. These gloves are not too bad in the wet weather. The exterior of them is made mostly of a nylon which repels the water pretty well up to a certain point. They don’t have a Gore-Tex or Dintex membrane to keep the water out 100% but it will have to be pretty heavy rain before your hand gets wet. You might find that after a while in the wet weather that they start to absorb water and once this starts it doesn’t get better until you’ve dried them completely. They basically start to absorb water and then they get really soggy and heavy. Like I said, this is only after long hours in wet weather or really heavy rain. So they are water resistant to a certain point and the batteries won’t get damaged in the wet weather because they’re in a waterproof pouch. For this category I’m giving these gloves a 16/20. Ivation is not a well known name in the heated gloves industry and I think that as I’m writing this, these are the one and only pair of Ivation gloves available. This doesn’t exactly give me a lot of confidence in the quality. Putting that aside I’d have to say that the gloves look like pretty good quality upon inspection. The stitching looks good and straps, velcro and electronics all look good. I have read some negative reviews saying that the seems started to come apart but I didn’t personally have that problem. Knowing what I know I would say that the quality is ok. These come with two 3.7V/1800 mA lithium batteries which is less juice than you’ll get from most heated gloves. Although they have less juice, the batteries are also physically smaller which is nice because they are light weight and they don’t bother you at all when you’re wearing the gloves. They are advertised to get 2.5 hours of heat on the highest setting, 4 hours on medium and up to 8 hours on the lowest setting. This is comparable to what a lot of the big companies are providing and my results were pretty much bang on with these results as well. Getting heat for that length of time is great for these small batteries but the reason they’re able to get heat for that long is because they aren’t nearly as hot as more expensive pairs. You can still feel the heat and it still feels warms, but they don’t pack a huge punch. I guess that’s why they cost less. These gloves fit pretty much true to size. If I had to lean one way I’d say go for the bigger size but that’s only if you’re truly between sizes. If you don’t know your size you should have a look at our Sizing Guide. So I know that I wasn’t ranting and raving about these gloves and I may have sounded a little bit negative towards them. This is not because these gloves are bad. It’s only because I’m comparing them to the top of the line gloves on the market. Anyone who just wants a little extra heat and isn’t too picky about little details would love these gloves. They work exactly as advertised and they should make you happy in the end especially for the price. You will have a hard time finding a pair of heated gloves for much less than these I promise you that. Thanks very much for stopping by today. If you have any questions or comments please use the box below and I’ll get back to you ASAP.